Cool ways to display your photos! Hanging up photographs againstthe wall is not a new phenomenon. Human kind has had a liking of portraits as far back as modern history allows, and even beyond it. 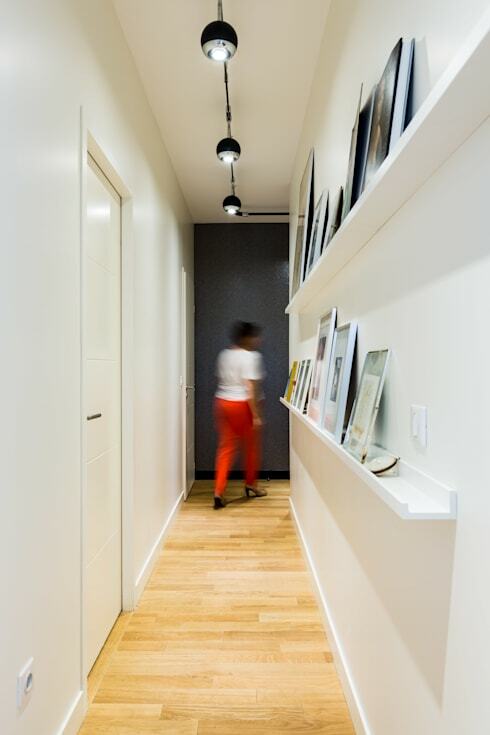 As photography has become more and more accessible to more people across the globe, the display of pictures is omnipresent in homes, offices, and any type of spaces people live and move in every day. With every modern phone equipped with at least one camera, snapping a meaningful or aesthetically pleasing scene or moment is no longer a rare occurrence and most people take loads of photos on a daily basis. Some even enlist the services of professionals to capture just the right emotions. Choosing the pictures worthy of display in your life is a different matter, and if you have found a set of such photographs, you need to find an equally meaningful way of displaying it. So today we bring to you an ideabook with some interesting and unique ways to display your special moments, since they deserve to be noted! Long gone are the days of boring old frames for your pictures. Not only does this look very unimaginative and dull, it can also be a costly affair. Nowadays, there are a multitude of creative options that does not have to break the bank, or in some cases, not even the piggy bank! Our first solution we have for you involves the use of twine. That right, only twine. Can’t get much cheaper than that! Or simpler, in fact. Twine can be made into straight, circular and geometric shapes, and photos can be attached in various ways. It’s up to you to design the display, but twine, whether simple white or multi-coloured, can give a fresh and interesting look to your picture display. Another option is to use twine in conjunction with a notice board. This way, you can simple wind the twine around the board as desired, and slip in the pictures without worrying about attaching it. Washi tape may be one of the greatest inventions of DIY. By this time, you have surely heard of this multi-purpose project, or at least the hype around it. Washi type is simple a strip of waxed paper coming in a variety of prints, with adhesive on the one side. You can easily apply or remove it from a number of surfaces without effort, since it does not stick as much as other forms of tape. 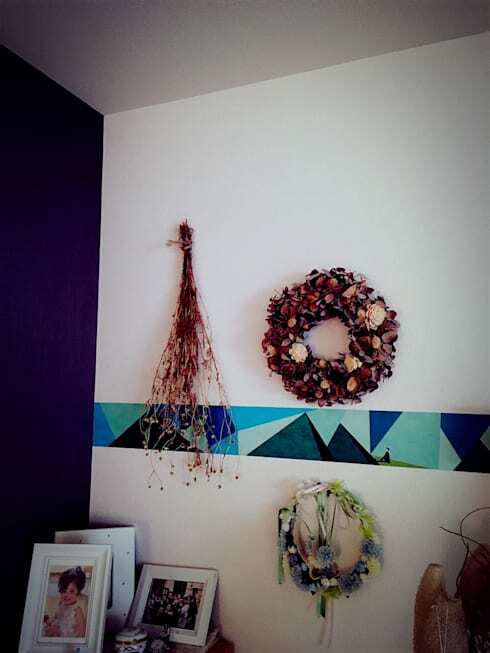 The fact that washi tape can be so easily removed without damage, means that it can be safely applied to walls, even in homes where you are renting. This makes it a better solution than actual photo frames, since you will be causing no structural alteration or damage to the wall. Lastly, as we have mentioned, washi tape comes in an almost endless variety of colours and patterns. 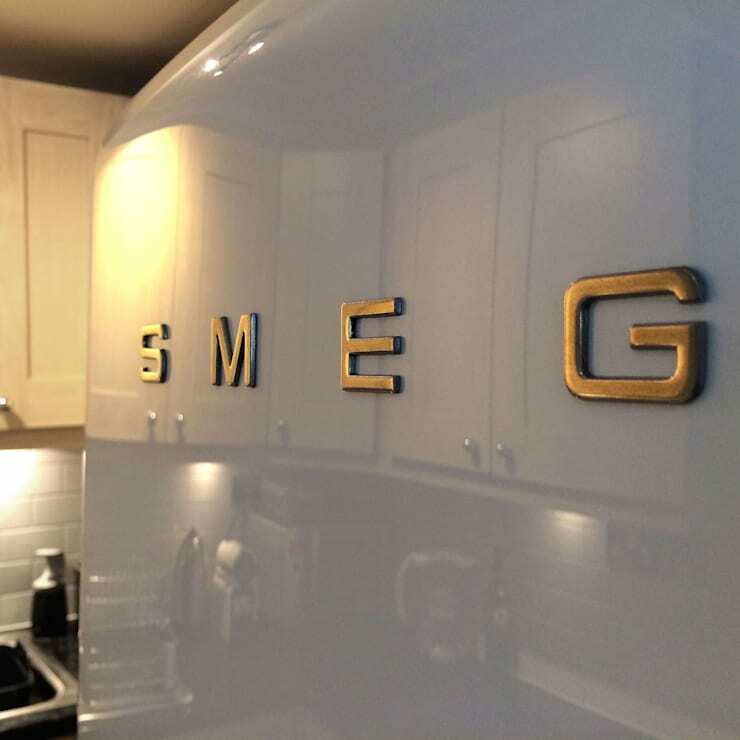 This allows for you to highly individualise your photo display. These types of displays are ideal for personal spaces, such as your bedroom. If you are a purist, and believe that photos belong inside photo frames, we haven’t given up on you either. You can still be creative whilst retaining your loyalty to convention, or maybe you have a bunch of old frames around that you want to use, but just not the right ones for your particular pictures. The solution will be to use a series of clips and strings inside these frames, creating a fresh look. Pictured here is an example without the frames, but you can easily imagine who you can incorporate this look inside a large frame or a few connected ones. 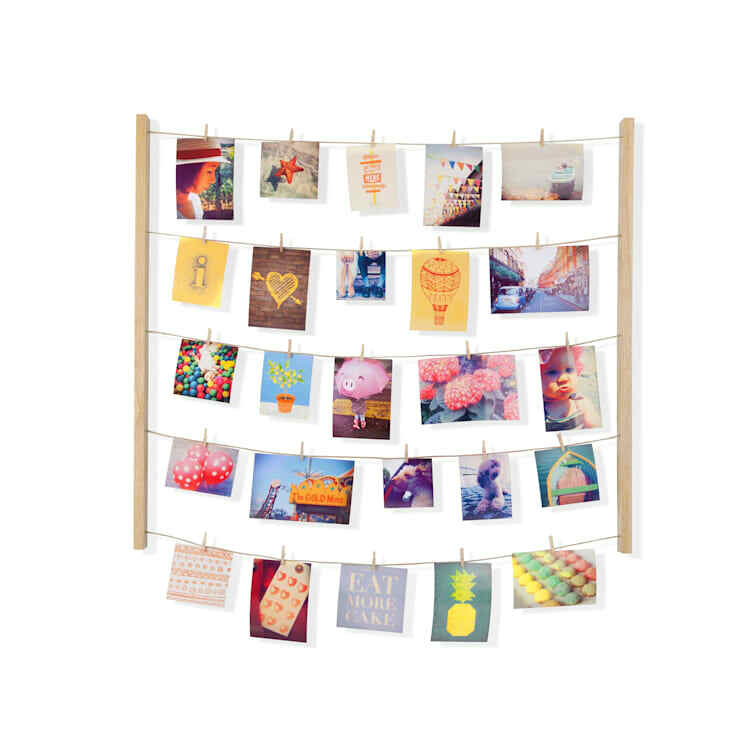 Another fun and beautiful way to display your pictures is one you might not expect at all. Well, if you are a nature lover, you may already have the infrastructure ready! Hanging your photos from a tree branch can create a lovely effect as well as a conversation-starter in any room. There are few things that beat the homely, rustic appeal of tree branches or logs, and it may just be the ideal way to present your moments of nostalgia. What’s more, you can also use this item to fulfil other purposes, such as hanging jewellery or lamps (pictured), in such a way integrating the feature into your room. This is an option that has become available to us since the cost of digital printing has lowered and lowered. Nowadays, we print our photos on any number of surfaces – cardboard, fabric, and even porcelain. We are sure many of you have been subject to the coffee cup with an embarrassing picture and even more embarrassing quote on it for your birthday. Well, there is a way that you can use this technique without cringing. Printing your pictures on fridge magnets can be a good way to go. This way, you can have your photos somewhere you can view it every day, and it may serve other purposes too, such as holding up the shopping list. 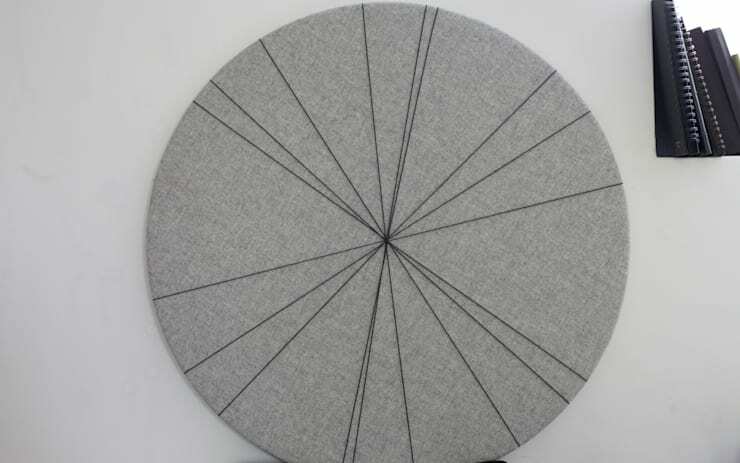 This is a trick that has become very popular in contemporary crafts, DIY, and hipster cafes! Who hasn’t had a menu at the latest craft bee restaurant presented to them on a clipboard? Well, they’ve got something there, since this look is stylish and industrial, well in line with current trends. In addition to all of this, it is one of the simplest ways to display your pictures, as you simply mount the clipboards, and clip in the desired picture. The great benefit of this method is that you can chop and change your photos as many times as you want without too much effort. Once the clipboards are mounted, your possibilities are endless. The best part? An A4 retro wooden clipboard will only set you back about 30 bucks at most stationary outlets. Not bad! Similar to the idea of the clipboards mentioned above, you might also consider mounting little trays on the wall, in which you can once again change your selection of pictures as desired. With this option you can bring in more variety, as you can use trays of different colours, textures, shapes and sizes. Just like frames, but cheaper and more convenient! This can also become a doubly-sentimental project. If you are a collector of trays or porcelain you can use these as backdrop for you most cherished memories. Go one, we won’t judge you! 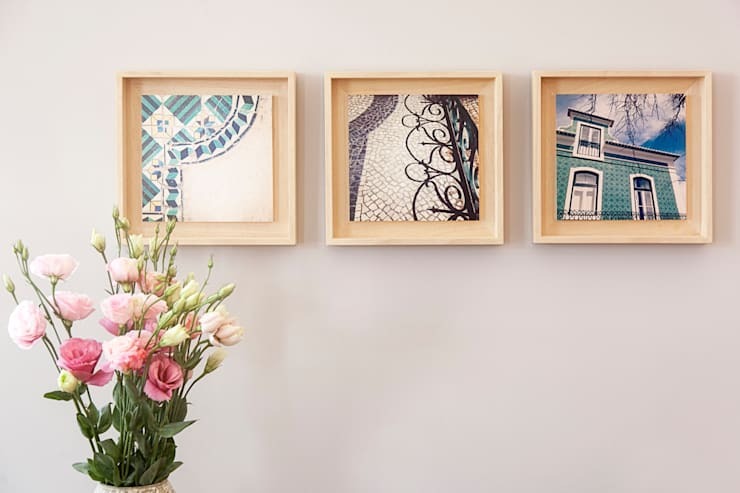 For more photo-fun, take a look at how to: Hang your pictures like a gallery. Which of these options did you like most? Do you have any ideas? We'd love to hear your thoughts!